Sanders' legislation is broadly similar to prior versions: It would effectively replace all insurance with a more generous version of Medicare that covers every American with no copayments or deductibles. The updated bill adds new benefits for long'term care to help seniors remain in their homes and communities. The Sanders bill is the definitive leftmost position on health care for 2020. Several presidential rivals, including Sens. Elizabeth Warren, Cory Booker, Kirsten Gillibrand, and Kamala Harris are among 14 senators co-sponsoring it, but their campaigns have largely pivoted toward discussing more incremental plans that preserve private insurance. That was a contrast to Sanders, who has taken a bold approach to policy, but a more measured one when it comes to legislative procedure. Sanders has suggested he favors "filibuster reform" but sounded skeptical in an interview with Huffpost over the weekend about proposals to abolish it. He noted that President Donald Trump favored eliminating the filibuster, which should make Democrats "a little bit nervous," and that "you have to protect minority rights" in the Senate. "I don't think you can just simply shove everything through," Sanders said. "There's an argument for that, by the way, but that's not where I am right now." Some supporters suggested Sanders might be thinking tactically. With Republicans in power and already altering Senate rules to push through Trump judicial nominees, putting Democrats on record behind broader rule changes could give GOP Senators political cover to make them first. At the same time, Sanders suggested an alternative plan in his HuffPost interview: He could pass his agenda through existing means like budget "reconciliation," a procedure that requires a simple majority. But the procedure comes with constraints and the Senate parliamentarian, who is tasked with interpreting the rules and whose word typically carries the day, can be hard to predict. There are ways to overrule or replace the parliamentarian, but they would spark their own fight over rules and norms, similar to the filibuster debate. Budget experts interviewed by NBC News were split on how much of Sanders' agenda might pass given these obstacles. While expanding health care and raising taxes on the rich seem achievable to some degree, other priorities like immigration, curbing money in politics, and climate change could be tougher hauls. And the bigger and more complex the proposal, the greater the risk that a crucial component might be stripped that undermines the whole package. "I think the best way to do it would be design a Medicare For All system," Booker, who also opposes ending the filibuster, said in an interview with WCBS 880 on Wednesday, "but anybody who says those words, 'Medicare For All,' who's running for president, the next thing out of their mouth should be talking to people about well, if we have 50 (votes), If we're a split Congress, what are you gonna actually do in your first year to make health care more accessible and affordable?" On the right and center-left, critics challenged the new Sanders bill over its cost — $32 trillion over 10 years, according toone estimate by the conservative Mercatus Center — and its elimination of existing private plans. Republicans have made single-payer health care an early focus of attacks heading into the 2020 election. 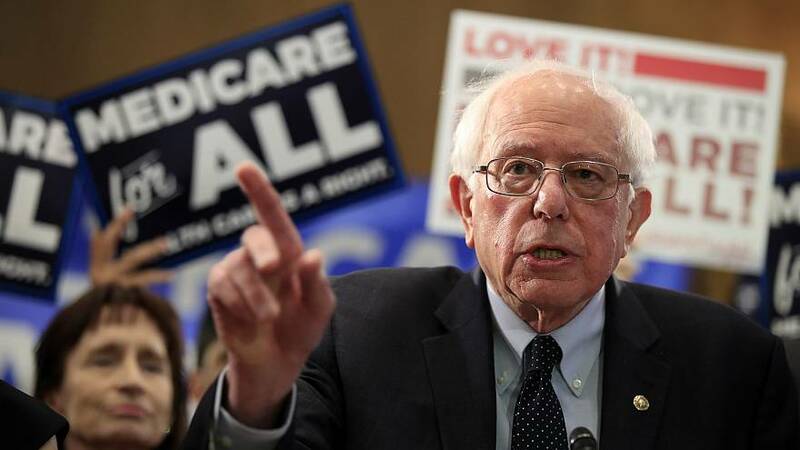 Americans spend far more per person on health care than other developed countries, and Sanders has argued his plan will save money by reducing overhead and provider payments and negotiating lower drug prices. He has not specified how he would pay for his plan, but offered a menu of possible options on Wednesday, including a 4 [percent payroll tax on workers and 7.5 percent tax on employers, higher estate and income taxes on the rich, and new fees on large banks. "Medicare for all is the opposite of practical, and it destroys our system rather than building on its successes," Lauren Crawford Shaver, Executive Director of the Partnership for America's Health Care Future, a coalition of trade groups opposing the bill, said.